WARNING to All Customers shipping Motorcycles. bike with miss the flight!! What do I have to do to prepare for my motorbike to be shipped as dangerous good? Motorcycles are classified as dangerous goods in international air transport. Air Canada had a great deal last summer !! Now, motorcycles are considered Dangerous Goods for transport by aircraft and as such, certain preparations for the bike (and documentation) are required. No worries! That's where we fit in. Dangerous Goods Packing Services Inc in Mississauga will guide you through the preparation procedure. IF Air Canada starts the Bike program in 2017 then you would bring the bike to Air Canada, the day before your flight, with a quarter tank of gas or less. (VERY IMPORTANT) Then disconnect the battery and tape up the leads and the battery posts with black electrical tape. Then tie back the leads to secure them to the bike frame to prevent them from flopping around and causing a short circuit. That's it ! Air Canada will take care of the rest. We will prepare, and sign, a DG declaration form for your trip and just present this form to the DG Air Canada Cargo agent on duty along with your waybill number assigned to you by your Air Canada agent. (you may book up to 30 days in advance) Of course you will have to go through the same procedure when you return. We will prepare documentation for that leg too. Our cost to you is $125.00 ea. leg. taxes included. After the success of Air Canada's 2017 campaign, offering substantially reduced rates, to "Fly Your Bike" to destinations within Canada and over in Europe, We are waiting for Air Canada to start there program again. Contact Air Canada Starting in April right through September 2018. Are you shipping one way as a permanent export or do you require a round trip costing? Besides ocean transport, our air freight division offers services for both importing and exporting motorcycles from the Canada. 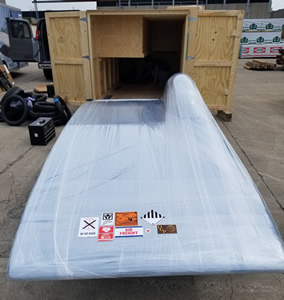 However, when using any air freight service all bikes must be crated except with the Air Canada Cargo Special accross Canada using certified heat treated and stamped wood. There are additional documents that are needed with the most important being the Dangerous goods form. Also, the cost of shipping motorcycles with air freight is based on cubic volume due to the demand for space and weight limits on most airliners. With our motorcycle transport safety records exceeding the industry's standards, you'll have peace of mind knowing that your bike is in safe hands.